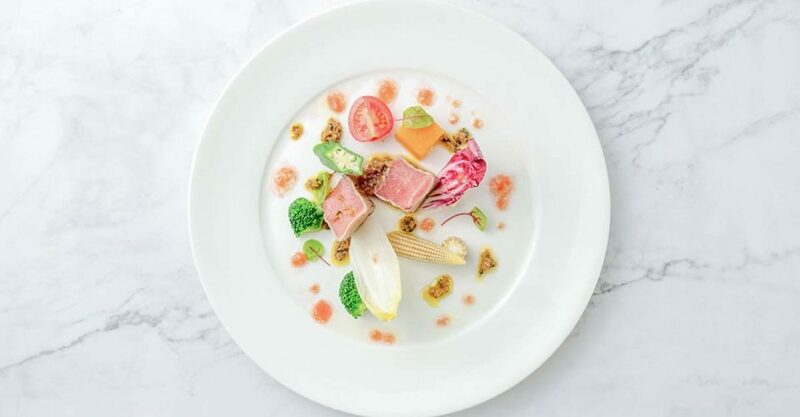 No Borders: Lumi is a “borderless” restaurant concept in Pacific Place that brings together some of the favorite dishes Japanese chef Kihachi Kumagai has created throughout his career. Look & Feel: Named for the word “luminous”, Lumi is bright and airy, as well as cosy and intimate. The mall’s bright lights and an abundance of greenery evoke the feeling of a “Parisian greenhouse”. Diners can slip into booths or small tables done up in quirky patterns and bottle green. At the center of the restaurant, delectable desserts are displayed in a glass counter. On the Menu: Expect pastas, salads, and seasonal fish and meat dishes inspired by Japan, France, Morocco and Senegal. Coffee and pastries are available in the morning, while lunch sees the appearance of lighter soups and sandwiches. Try the Kadaif lobster with Thai-style mango salad or Kihachi’s signature spaghettini glacier with fresh Hokkaido sea urchin. Meet the Chef: Chef Kihachi boasts a five-decades-long career and formerly worked under the late Joël Robuchon. Great For: A light, fresh lunch or a shopping break. FYI: Office workers in the area will benefit from the restaurant’s grab ‘n’ go service.